On Wednesday morning Todd Foster and Scott Miller set out from the Sinclair Lewis Campground in Sauk Centre. The duo are continuing their 150 mile trip down the Sauk River mapping obstructions as they go. Although the pair say they haven't encountered many fences on their journey so far, those remaining do violate state law. In order to find a solution to the fences, the Sauk River Watershed District began offering a cost-share program a few years ago that funds up to 50 percent of landowners' costs to come into compliance. Funds may be dedicated to both alternate watering systems and fencing that runs parallel to the bank and extends about 25 feet into the water. These measures allow cattle to drink from the river without entering it. According to Holly Kovarik, SRWD's administrator, the organization has received grants and loans that make this possible. For more information on the fencing issue, see Sunday's coverage. "The watershed district is a cost share and we have pursued grants specifically for exclusion fencing that [landowners] can put along [the river] and keep the cattle off the river," she said. Kovarik said the group has a number of reasons they are looking for a new solution. In part, she said, one of the SRWD's primary purposes is to monitor water quality. She said removing cattle from it would be a step in the right direction as the water currently tests positive for E. coli. In addition, according to Kovarik, a number of canoeists and kayakers have gotten caught in the fences, many of which are made from barbed wire. 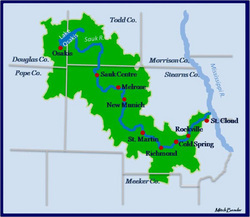 Tell us about Minnesota's rivers and streams We want to know about the rivers and streams that you know best. Which are in the best condition? Which ones have problem spots? Share your observations here. "You're moving down the river pretty quickly, come around a corner and there's a fence there," Adam Hjelm, SRWD's public outreach coordinator, said. "You don't have time to react." Hjelm was part of a group that canoed a portion of the Sauk River in 2008 in order to catalogue bank erosion in addition to logs and fences blocking the river. But ultimately, Kovarik said, the cost share program is entirely voluntary and SRWD cannot force landowners to participate. However, she added that "more than I can count" have taken them up on the offer since the program began.